The decisions new CEOs make during their first few months on the job have a decisive impact on whether they ultimately succeed or fail. The transition period is a time of opportunity, but also great vulnerability, especially when new leaders are expected to change their organizations in fundamental ways. CEOs who are promoted to the top spot from within must transform their relationships with former peers who are now subordinates. They also must balance the needs of the whole company rather than only those of functions or divisions they previously represented. Executives hired from outside have to quickly get up to speed on customers, markets and products, while also adjusting to a new organizational structure and culture as well as forming critical relationships. The decisions new CEOs make during their first few months on the job set the tone for a new leader’s tenure. Building credibility creates momentum during the early months on the job that allows the new CEO to exercise increasing authority and use it to define and articulate a new direction for the organization. Consider the transition of Mark Hurd. Hired as CEO of Hewlett Packard after the dismissal of Carly Fiorino, Hurd faced high expectations from every front to get HP back on track. Some analysts were pushing for the divestiture of the company’s personal computing business (a controversial acquisition by Fiorino to diversify product lines) and a tighter focus on its imaging products business. Other challenges included potentially damaging losses of key talent, demoralized employees and a nervous board of directors. In short, the pressure on this first-time CEO was intense. The result? A dramatic improvement in the company’s ability to face up to festering problems and move more nimbly-early successes that positioned Hurd to make still deeper changes that have profoundly improved HP’s performance. Conversely, the new president of a large retail company got off to a rocky start and never recovered. Brought in to instill increased discipline to hundreds of stores across North America, he had been a rising star in an organization known for its disciplined execution, strong systems and cutting-edge procurement infrastructure. But he and the board underestimated the magnitude of the adjustment he faced coming from a disciplined company with well-honed execution capabilities to one where those capabilities had to be created and institutionalized in the culture. Rather than focusing on a few broader themes and identifying the vital priorities on which to concentrate, he tried to make deep dives on each part of the large organization. Then he made some bad early calls that sapped his credibility and, ultimately, he was replaced before his second anniversary. How can a newly minted CEO avoid such pitfalls? Based on research and experience working with senior executives in transition, the following eight fundamental principles can create momentum that will carry a new CEO through-and beyond-the transition period. The process of clarifying expectations by both the board and the CEO must begin during the recruiting process and continue well into the transition period. The board should establish what it believes to be the most important issues to be addressed, solicit commitment on the part of the CEO to achieving them, and put in place a clear set of metrics to evaluate progress. The new CEO must ensure that expectations are realistic. One key success factor is a shared definition of what success looks like. Failure to drive convergence led to the undoing of one new CEO who had thrived at a holding company known for its dealmaking capabilities. During the recruiting process, directors had stressed the need for growth, mentioned cash-rich coffers, and emphasized the company’s position as the industry’s low-cost producer. The new CEO concluded that he had a mandate to make acquisitions. Trouble ensued due to two fundamental misalignments. First, the board envisioned a combination of organic internal growth and acquisitions. Second, the board believed it would be involved in deciding the right mix of each path and the plan to increase the size of the company. The lead director saw it differently. “We’d done a few [deals in the past] and the integrations weren’t exactly textbook successes. We wanted to see a combination of internal and external growth,” he said. “But what was even more disturbing to us was that we really didn’t hear much about his plans until he came to a meeting saying he was ready to go after [a large competitor] and it would probably end up being a hostile takeover. He’d lined up bankers already and had done a really detailed plan.” The board told him to slow the pace of his acquisition plans and engage in more consultation, and the die was cast. New CEOs who make good transitions consider a number of factors- the magnitude of the challenge, the realism of what is expected, the extent to which you will be given the scope to make decisions, as well as how it will feel to run the organization and the impact on family or lifestyle- before even taking the post. They resist the impulse to put off preparation for a new role in order to organize personal affairs or fit in some family time, and devote the weeks prior to entry to absorbing information about the organization and planning for the first six months. They focus on three distinct types of learning: technical, political and cultural. Technical learning includes understanding the nature and key success factors of products, technologies, markets and customers; the inherited strategy and its organizational requirements; and the company’s operational and human capabilities as well as limitations. Political learning means assessing key sources of power, including those who influence major decisions and the alliances or coalitions which determine the power structure. Cultural learning involves identifying the norms, habits and customs that combine to shape the de facto values of the organization; understanding how they came to exist; and grasping how strong and firmly entrenched they are or the likelihood of changing them. New leaders must immediately identify powerful internal and external constituencies and begin gaining their support during the transition. This lays the groundwork for building coalitions to drive key initiatives and enables the new leader to determine those he can count on, those in whom he needs to invest, and those whom he needs to confront. There are four key alliance-building questions that should be on the top of every new CEO’s list. First, whose support do I need? Second, what do those individuals or groups want most and why? Third, what style of influence worked here in the past and what will work well now? (The use of data or precedent; the promise of rewards or threat of taking away something that is valuable; involving people and enabling them to participate more; or painting a compelling picture of a positive outcome?) Fourth, if my preferred style will not work well here, who can I enlist to complement my way of influencing? Have they stayed up to date on technologies, market trends and methods? Are they a positive influence in this organization? Do they care only about what is best for their department or can they balance that with what is essential for the whole organization to thrive? Do these people know how to cooperate and have they been expected to do that in the past? Do they work well as a team in the normal course of events or only when there is a crisis? How is this group perceived by the layer of managers under them? Are they respected or feared? Do these people complement one another? Does the collection of abilities they have complement mine? Are there people in the company who should be on the senior management group but are not. If so, why? When assessments are negative, new CEOs confront the dilemma of staying with people who are less than what they need or making a change early in their tenure, perhaps before they have built a high level of personal credibility. The decision to remove a senior-level manager is among the most serious and complicated that any leader makes. But among the most common regrets CEOs have is not replacing senior-level people once it became clear they were not the right fit for the situation and for the CEO’s style or vision. At a minimum, failure to take the bull by the horns will slow progress; at worst, it can contribute to derailment. By the end of the first six months, the new leader must have made substantial progress in addressing some of the business’s most pressing problems. This means marshalling resources to focus on issues that meet three criteria: They yield tangible financial benefits; they address issues that employees understand to be important; and results can be achieved early in the new leader’s tenure. Examples include bottlenecks that limit productivity and incentive systems that undermine performance by creating internal conflict. By contrast, efforts to improve the effectiveness of meetings or do some team building may make eventual contributions to the business, but they don’t provide early wins. Leaders lay the seeds of their own destruction when they fail to gain control of the communication processes of the company. As a result, they do not effectively get their messages across to the people whom they most want to influence, nor do they shape the mood or morale of the organization. The majority of new CEOs are effective communicators, but most are thrust into situations where they must interact with more diverse groups than ever before, or they inherit a communication system built for a different era and for predecessors with different styles. The task of communicating effectively becomes more complex and important in a larger organization. Adjust or create a new formal communication system. Utilize or create an informal grapevine vehicle. Use both to tap into what is on the minds of the employees whose beliefs and feelings are most important. New leaders should assess the inherited formal communication system during the weeks between accepting the role and starting the job. What are its objectives? How did it come to be what it is? Who are the target audiences and why? Is it mostly one-way or two-way? Does it work? If, as is usually the case, it must be improved or adapted to the new leader’s style, the sooner this is done the better. Then there is the informal communication system, one that is faster and often more informative than the formal one. The wise new CEO will seek to understand early on how this informal system works. The new head of a pharmaceutical company known for its powerful sales force found out that the fastest way to learn about attitudes and morale among the salespeople was to talk with the handful of the most senior regional managers who had mentored or supervised many of the highest performers through the years and stayed in touch with them. What we mean by vision is a vivid mental image that depicts the desired future state of the organization in an inspiring way. It is a picture of what will be seen, heard and felt in the ideal organization that fulfills that mission and achieves those objects. It’s about the desired culture and the values it represents. If it’s not inspiring for the leader and for key people in the organization, then it’s not a vision. Why is vision important? Why not simply stay with objectives and strategies? Because the wellspring of motivation in organizations flow from having clear answers to three key questions: What should I be trying to accomplish? How should I be trying to do this? Why should I put out extraordinary effort to do these things? In combination with incentives, a clear and compelling vision answers the “why” question. Finally, and perhaps most importantly, the new CEO has to build and use the right kind of advice and counsel network. No leader is an island. 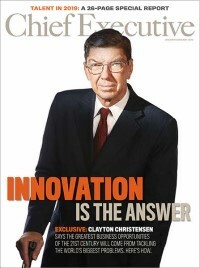 New CEOs inherit problems and mistakes left by predecessors. When they are hired from the outside, these problems and mistakes may be far from obvious; things rarely are what they appear to be. So it’s essential that new outsider-CEOs find ways to accelerate learning about markets, products, technologies, organizational capabilities, team politics and culture. Given the magnitude of the learning challenge, the wise new leader will seek to identify trustworthy people who understand the root causes of known problems and who can assess the magnitude of potential ones. Locating the right internal advisers is essential once the new CEO is aboard. For CEOs promoted from the inside, the roles and responsibilities of the chief executive often are new and unfamiliar, and new leaders also must often deal with scars from old battles that were lost by those who are now subordinates. So the CEO must find trusted advisers on whom he can rely for insight into political agendas. Regardless of whether new CEOs are insiders or outsiders, they face the challenge of getting the organization to embrace a new way of operating. Getting the right help to navigate the unpredictable waters of organizational transformation may make all the difference. Think of this prescription as the recipe for an effective transition. While these eight ingredients are not a guarantee of success, they will substantially improve your chances as you begin the CEO leadership journey. Dan Ciampa and Michael Watkins are co-authors of Right From the Start: Taking Charge in a New Leadership Role. Ciampa (www.danciampa.com) is the former CEO of Rath and Strong and author of Taking Advice: How Leaders Get Good Counsel and Use it Wisely. Michael Watkins is the co-founder of Genesis Advisers (www.genesisadvisers.com) and author of The First 90 Days: Critical Success Strategies for New Leaders at all Levels.